A-HOTEL.com - Luxury and cheap accommodation in Paris, France. Prices and hotel, apartment booking in Paris and surrounding. This indicative offer was derived from the most recently booked accommodation in Paris and sort by the price, from cheapest Paris accommodation to the most expensive hotels. To select accommodation by your preferences we recommend to choose from 3 082 accommodation offers in Paris in total. By entering the dates of your overnight stay in Paris and using the filter tools you can sort the best possible accommodation for you. The entered dates of your stay are crucial for the most accurate offer as it derives all the online information on pricing and availability of Paris accommodation. Then you can book the selected Paris lodging (hotels, apartments etc.) immediately. Located a 5-minute walk from Sacré-Coeur Basilica in the lively Montmartre district, Aparthotel Adagio City Paris Montmartre offers modern, fully equipped apartments with free WiFi. Aparthotel Adagio apartments feature a fully-equipped kitchen area, a bathroom with a shower, and a flat-screen TV with international channels. Set in Paris, Mode - Arc de Triomphe features free WiFi, 750 metres from Arc de Triomphe and 1 km from Palais des Congrès de Paris. A fitness centre is available on site and a free glass of wine can be enjoyed on arrival. 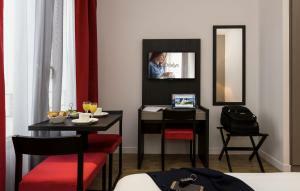 Hotel des Carmes is set in Paris, 500 metres from Notre Dame Cathedral. Located 350 metres south of the River Seine, the property is 1. Located opposite the Buttes Chaumont Park, this Aparthotel is a 20-minute walk from Paris’s Canal Saint-Martin. This eco-friendly property offers an outdoor garden and apartments with free WiFi and soundproofed rooms. Sejours & Affaires Paris-Davout offers pet-friendly accommodation in Paris. Opéra Bastille is 3 km from the property. Located 200 metres from the Sacré-Coeur in Paris, Odalys City Paris Montmartre offers studios and apartments a 15-minute walk from Moulin Rouge. Guests may have a relaxing time in the wellness area at an extra cost. Hotel Andréa is set in the 4th arr. in Paris, 300 metres from Pompidou Centre and a 2-minute walk from Hôtel de Ville Metro Station. Situated in Paris, My Maison In Paris - Ile Saint-Louis offers free WiFi and units fitted with a kitchen, seating area and flat-screen TV. Each unit is fitted with a dishwasher, oven, a coffee machine, as well as a microwave and kettle. Appartement 2-Chalgrin Paris in Paris features accommodation with free WiFi, 1.3 km from Arc de Triomphe, 1. Hotel The Originals Paris Montmartre Apolonia is located in the residential area of Montmartre in Paris, a 10-minute walk from the Sacré-Coeur Basilica and Place du Tertre. The Stade de France is 5. Located within the Golden Triangle in Paris’ 8th Arondissement, the 5-star Hotel Bowmann offers 53 designer rooms and suites in an elegant, traditional Haussmann building. Just 1 km from the Champs-Elysées, it houses a luxurious spa and restaurant. Housed in a 19th century mansion, the hotel is located a few steps from the beautiful Eiffel Tower and Le Trocadéro, one of the most stylish and elegant districts in Paris. Free Wi-Fi access is provided. Located 1.1 km from Luxembourg Gardens and 1. Located in the very centre of Paris, just a 10-minute walk from The Louvre and 450 metres from Opéra Garnier, this hotel offers air-conditioned rooms and a bar. Guest rooms at Ascot Opera are decorated in a classic French style and some feature wooden floors and exposed beams. Located in the 16th district of Paris, La Clef Tour Eiffel is just 900 metres from the Eiffel Tower and 4.4 km from Parc des Princes Stadium.